I’m almost *giggling* while I post this..
People are always asking me which time server to use. Here’s the list of time servers hosted by the NIST. You *should* use time.nist.gov, in order to let them round-robin your requests across all of their servers, for load-balancing purposes. Finally, I can use Windows 8 without feeling like I’m trying to work from a smart phone. Microsoft, stop forcing the results of your focus groups on me, and stop screwing around with UI dev. You’re not helping. At all. I don’t care what the study says. I understand the whole touch-screen thing, there’s still no excuse for your assumption that I’m giving up my mouse because you want me to. Download IObit Start Menu 8 now! Absolute OpenBSD 2nd Edition is here!!! Michael Lucas has done it again. 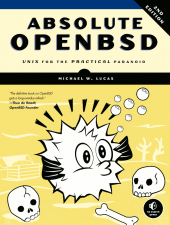 In documenting arguably one of the driest topics on the planet, Mr. Lucas manages to add fun, trivia, and extremely useful knowledge of the OpenBSD team’s latest OS offering to an already excellent book. I read the first one 10 years ago or so, and this one is even better. The updated information on ProPolice, W^X, and the new PF features makes this book a no-brainer for *any* UNIX admin looking to add some extra security to his network, as well as a hobbyist who may be thinking of learning the ways of the shell. As far as I’m concerned, chapters 21 and 22 were well worth the purchase price alone. If ANY member of the Princeton Area OpenBSD User’s Group would like to read this book, let me know, and I can get you a copy. My only request is that you post what you think of the book on this thread, so the fine folks at No Starch Press can see it, as they were kind enough to get us this advanced copy! OP USA is tomorrow. Batten down your hatches.. The general gist of the message is that this attack will be in retaliation for war crimes committed by the USA against Iraq, Afghanistan, and Pakistan. The government of Mauritania was overthrown on 6 August 2008, in a military coup d’etat led by General Mohamed Ould Abdel Aziz. On 16 April 2009, General Aziz resigned from the military to run for president in the 19 July elections, which he won. In Mauritania about 20% of the population live on less than US$1.25 per day. Slavery in Mauritania has been called a major human rights issue as well as female genital mutilation, child labor, and human trafficking. According to the FBI, Open Source reporting claims that their previous attempt to “wipe Israel off the cyber map” was a total failure, with little to no impact. This is important. This means something. Support a free and open web!